from 10 a.m. to 1p.m. and 2 p.m. to 6 p.m. Think back to the fantastic life of Richard the Lionheart, the friend of Robin Hood, as Walter Scott related it in his novel Ivanhoe. 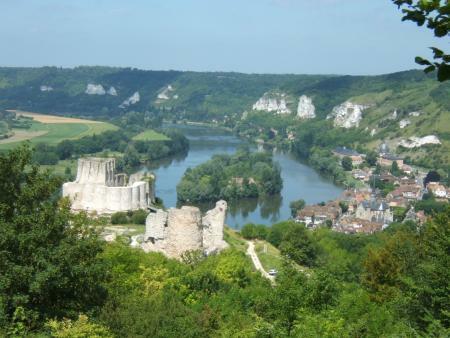 Chateau-Gaillard is the very place where these romanticized stories meet History. For this fortress was dreamed of, skillfully designed and built by the fiery Richard I of England, feudal Duke of Normandy, better known as Richard the Lionheart. This nickname was given in recognition of his bravery in the Crusades. Eight hundred years later, Chateau-Gaillard offers living proof that this celebrated ruler really existed. Its stones give an idea of Richard's nature. 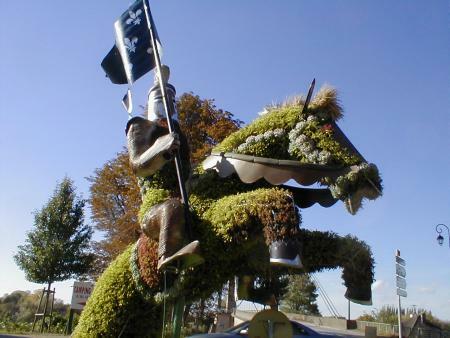 Like its creator, the stronghold of Les Andelys calls to mind strength, power, invincibility. Yet the virtually impregnable fortress would live only a few years, just like Richard, who was too confident in his talents as a warrior. It seems hard to believe that the construction of this massive stronghold was completed in one year, but it is historically true. One imagines the site swarming with thousands of laborers. Over 6,000 of them had to work relentlessly to achieve such a feat. Construction began in 1197 and was completed in 1198. Richard-who had spent a huge amount of money on it-could then exclaim: "How beautiful she is, my one-year-old daughter! 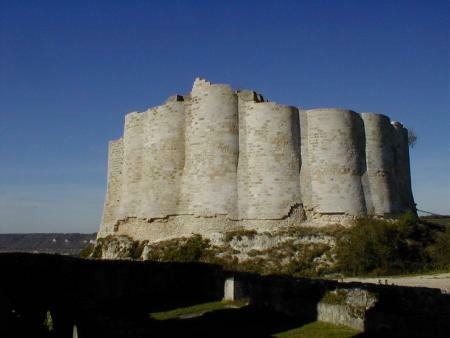 What a 'gaillard' (well fortified) castle!" 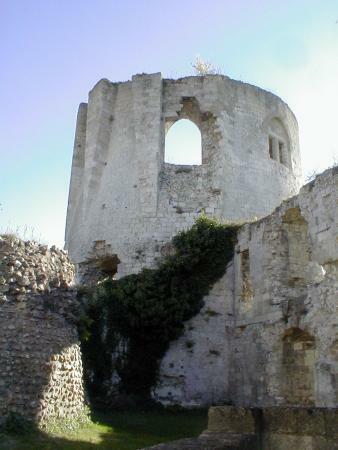 The fortress was meant to impress King Philip Augustus of France, whose lands expanded as near as Gaillon, about ten kilometers away. 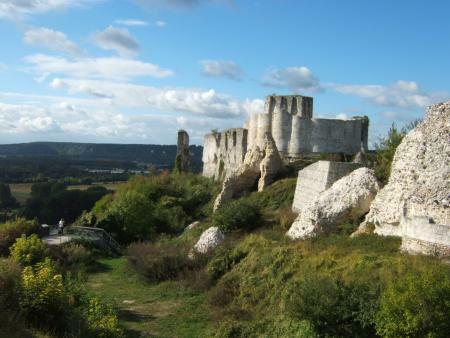 Chateau-Gaillard was the stronghold intended to prevent him from invading Normandy. Richard carefully chose the site for his fortress. The Seine takes a sharp curve at Les Andelys. In the curve in front of the peninsula, a cliff 100 meters high juts out like a boat prow over the river. A strip of land links this rocky spur to the plateau beyond. Richard took maximum advantage of this strategic position. The castle could only be attacked on the plateau side. Thus, a complete system of concentric defenses was erected on this side. 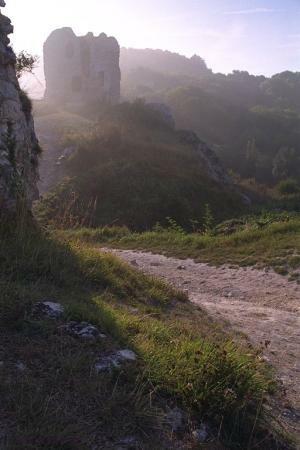 The donjon, the last retreat, was entrenched at the top of the cliff. Facing the plateau, a triangle shaped outwork, flanked by five towers, constituted the first defense of the fortress. A ditch 12 meters deep surrounded it. If the enemy managed to gain control of this bastion, he would come up against high outer walls. He would have to get over this rampart to get as far as the courtyard, then he would face the castle itself, which is to say the second outer wall surrounded by a second ditch. 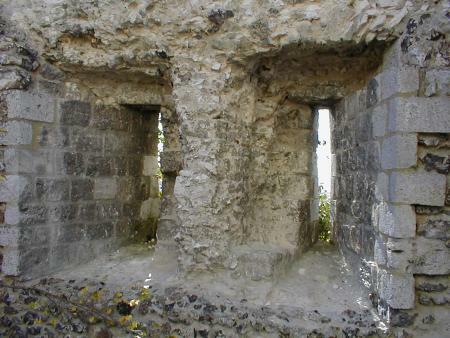 This second rampart is the most original feature of Chateau-Gaillard. Richard the Lionheart hit upon the idea of making an embossed wall rather than a smooth one. 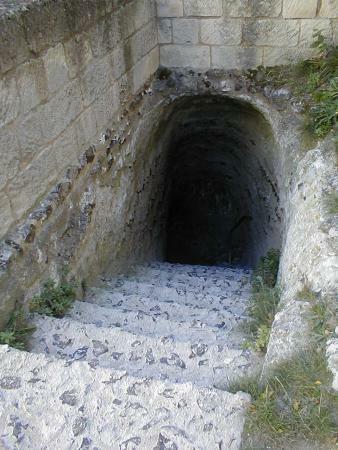 The rampart was made of 19 arcs of a circle pierced by arrow slits. The round shape gave less hold to projectiles, which had no salient angle to catch. In addition, it allowed for shooting slantwise through the arrow slits from any point of the wall, and thus the rampart had no dead angles. This structure was completely new in 12th-century France. A single gate was pierced in the embossed enceinte. It was not directly in line with the plateau, but on the side, forcing the enemy to advance along a part of the ward before standing in front of the gate. It was protected by a drawbridge and portcullis. 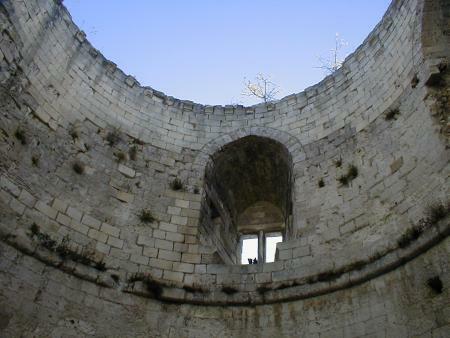 Visiting the inner part of the castle reveals another architectural feat: the two wells. The first one is located in the yard; the second one not far from the keep. It is 100 meters deep and was dug through the rock down to ground water. The well-diggers had to dig the stone by torchlight though flames would burn what little oxygen was available in the pit. Then they had to haul out tons of debris using ropes. This achievement is worthy of admiration. The keep stands inside the embossed ward. Richard gave it walls five meters thick and formidable machicolations copied from those he had seen in the East. They would not have the opportunity to be of any use. Beside the donjon stands the Governor's house. 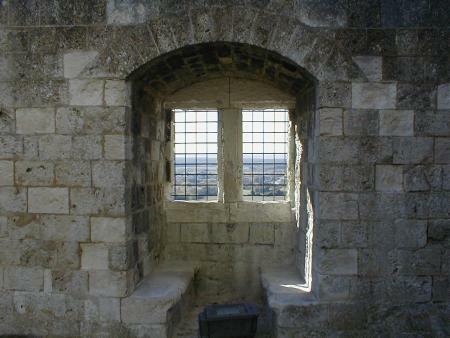 One can still see the mullioned windows bordered by stone seats affording a wonderfully panoramic view. Richard saw his castle completed, but the intrepid warrior did not see it fall, having died just a year later, on April 6, 1199. Richard took no heed that it was Lent-a time when fighting is forbidden- and attacked the castle of Chalus, near Limoges. It is said that he coveted a golden statue that had been found in a field owned by the lord of Chalus. Richard was wounded in the shoulder by a crossbow bolt shot by a defender of the castle and succcumbed 13 days later. His brother John Lackland succeeded him. John's first move was to sign a treaty with Philip Augustus acknowledging that he was the French king's vassal for all his fiefs except England. The sly Philip Augustus was farsighted: He would have the right to confiscate the lands of his vassal if the latter behaved badly. This was what happened as soon as 1202. John was judged in absentia by the French nobility for disobedience to the King and sentenced to seizure of all his belongings. There only remained to enforce the verdict: Philip Augustus launched the conquest of Normandy. 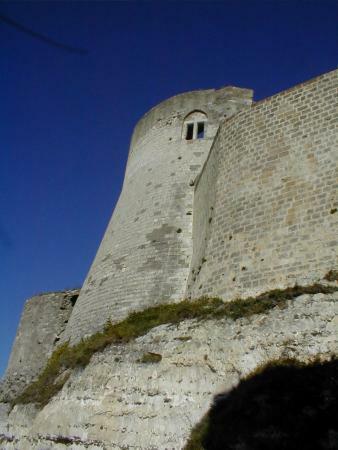 The French army needed little time to gain control of the appended defenses of the stronghold, in the loop of the Seine, on the island below the castle and in the village of Andely. The 1,700 inhabitants and town defenders fled to the castle. Considering that the citadel was too strong to be taken by storm, Philip Augustus chose to lay siege. His troops sat down outside the castle, but John Lackland did not react. Inside the fortress, Governor Roger de Lascy did his best. His food supply was sufficient for a year, provided that the villagers did not stay within the castle. The French army let a thousand villagers through, which annoyed Philip Augustus. The last refugees were expelled from the castle, yet as they were prevented from crossing the lines of the besiegers, they roamed for days between the two camps, until dying of cold or starvation. This tragic episode was called 'the useless mouths to feed'. After seven months of blockade, Philip Augustus chose to storm the fortifications. He built a covered road from the plateau to the advanced bastion. Under this shelter, men could bring bundles of wood and earth to fill the first ditch. They reached the bottom of the walls and mined the tower. When the hole was large enough, they kept a fire burning in it. A part of the tower eventually collapsed in a cloud of dust. The defenders of the stronghold had to withdraw behind the first enceinte. According to the chronicle written in praise of Philip Augustus, the victorious King of France, the besiegers easily wrested control of the outer walls. Walking around, one of them noticed a small window three or four meters up the wall. The Normans gave no thought to defending it, as it was the window of the latrines. On March 6, 1204, a few French soldiers climbed up through the window and entered the fortress. Judging by the noise they made, the Normans imagined there were many of them and hastened to light a fire in order to bar their way, but the wind blew the smoke back in their direction. The defenders were forced to hide behind the second enceinte. Historians have doubts about the veracity of this story. The most probable assumption is that the assailants penetrated the castle through the badly protected chapel that had been added by John Lackland, who did not have his brother's mastery of defensive design. As the French could not boast of having defiled a holy place, they invented this episode of the latrines. That same day, Philip Augustus bombarded the second wall with a great catapult. Enormous stones fell on the ward and eventually opened a breach. The defenders had no time to escape into the donjon, as they were too busy defending the breach. They were soon overwhelmed by the numerous assailants. The inner court was too narrow for them to fight in line. Roger de Lascy and his 129 knights were made prisoners. The brave defenders would be set free in exchange for a ransom some time later. 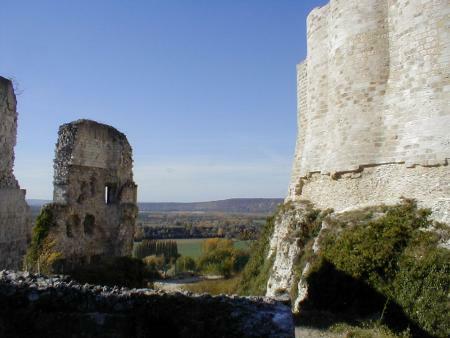 Once Chateau-Gaillard had surrendered, Philip Augustus was free to invade the fiefs of the Plantagenets, which spread southward as far as the Pyrenees and the Auvergne. In 1204, Normandy was made part of the Kingdom of France. The castle was repaired and still played a defensive role, especially during the Hundred Years' War, passing from one side to the other several times. Henri IV eventually had it demolished at the end of the 16th century, after a two-year siege, allowing monks who dwelt nearby to take stones to repair their abbeys. Today, the ruins of France's finest and most famous stronghold still exert a strong evocative force. Visiting botanists may notice peculiar flowers on the site. Some of the plants were brought back from the East by the Crusaders. They became acclimatized and have been reproducing there for centuries. � Photos & Texts A. Cauderlier webmaster in Giverny France area.